Used the Allurette washer and towel combo on a recent European trip. Was great for washing out underwear and summer blouses. The towels helped to get excess water out of my clothes prior to hanging them to dry. 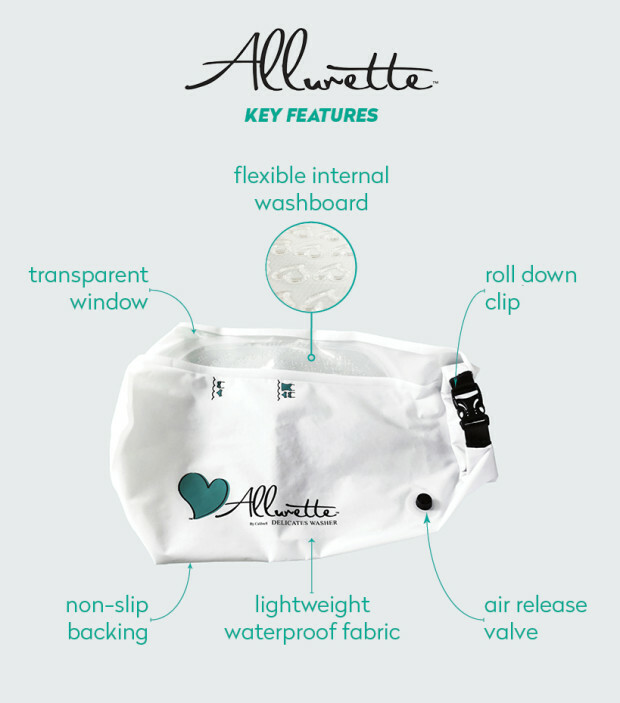 The Allurette™ washer is the new sister product to the Scrubba wash bag. Featuring flatter, more rounded washboard ridges that have been designed with the most delicate of items in mind, the Allurette washer excels at gently and effectively washing most delicates and hand-wash only activewear. The Allurette washer has been designed for home and travel to make the hand washing process easy, fast, and mess-free. Small loads can be gently and effectively washed in just minutes. It is perfect for fashion-lovers with lots of hand-wash only clothing, parents who need to wash baby clothes, active women, the environmentally-conscious, travellers, and those with sensitive skin. The Allurette washer is slightly smaller than the Scrubba wash bag and weighs just 112g. It is twice as effective as hand washing* and a lot more hygienic than washing in a dirty hotel sink. Save time: Small loads can be washed in the Allurette washer in just a few minutes. No more messy soaking or waiting for the washing machine, which is often too harsh on clothes anyway. Avoid mess: Allurette is self-contained, preventing you from having to mop up any soapy spills - ideal for anyone who avoids hand washing because the clean-up takes longer than the washing process itself. The Allurette washer can also be compactly stored after use. Be organised: Using the Allurette washer means no more soaking clothes in the sink or in buckets. The Allurette washer can also be used as a laundry bag for storing your delicates pre-wash, keeping them separate from the rest of your laundry. Extend the life of your clothes: The Allurette washer is gentle on clothes, keeping them looking clean, vibrant, and fresh, many washes in. Save money: Longer lasting clothes means less money spent on their replacement or restoration. The Allurette washer is also electricity-free and uses minimal water. As an added benefit, travellers can avoid hotel laundry fees by taking this highly portable wash bag along on their adventures. Protect your skin: Hand washing exposes you to harsh chemicals that can, over time, dry out your skin, leaving it cracked and worn. This makes hand washing a truly problematic task, especially for those who suffer from sensitive skin or conditions such as eczema. As clothes are rubbed from the outside of the Allurette washer, hands remain dry, with minimal exposure to potentially damaging liquid detergents. Care for the environment: Because the Allurette washer requires no electricity, uses minimal water, and enables grey water to be disposed of away from the water source, you can enjoy using your Allurette anywhere, confident in the knowledge that you’re respecting the environment and helping to maintain the beautiful planet that we all share. 49 cm x 26 cm when laid flat. 13 cm x 6 cm x 6 cm when rolled and clipped for storage. Allurette washer has been added to your cart!